Looking for a video company that offers a stellar B2B video production service? Need a promotional video for your product? Have an upcoming trade show but no video to WOW prospective customers with? When your customers visit your website, do you have a video that touts your offerings? There’s dozens of reasons companies need video nowadays. It’s important that companies partner with a video vendor that can produce cinematic, engaging video that represents their brand well. Consider 336 Productions! 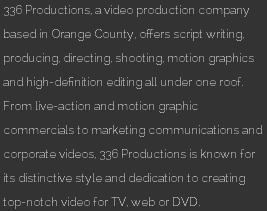 We offer every production service required to produce exceptional videos, and every type of video: case study video Orange County, education video Orange County, event video Orange County, sales video Orange County, product video Orange County, marketing video Orange County, social media Orange County.